Interesting to read again the comments in that article a year later and, when we look at the data for D&T subject entries and teacher recruitment, it can make for depressing reading. However, we all have different experiences of working in this subject area so I will simply present the facts and let you make your own minds up. In a document released at the end of the summer term, Ofqual published the GCSE and A-level entries for 2016. They also included a very detailed spreadsheet with all the subjects offered at various levels and plenty of stats to take in. I can heartily recommend a read but what exactly does it mean for this subject area? Before considering the statistics it's worth bearing in mind that they may be directly affected by changes in the education system namely the EBacc and Progress 8. The EBacc was first introduced in 2010 with the aim that students would begin studying the subject in September 2015 with a view to their examinations being taken in 2020. If I could offer one caveat, I apologise in advance if any of these facts are no longer 100% accurate, after all this isn’t an official document or an academic thesis, it’s a blog and if it prompts someone to go out and search out the facts for themselves then that’s great. The average of England, Wales and Northern Ireland for GCSE shows a dip in DT entries of around 6% on last year and it has been around the same for the previous 2 years. 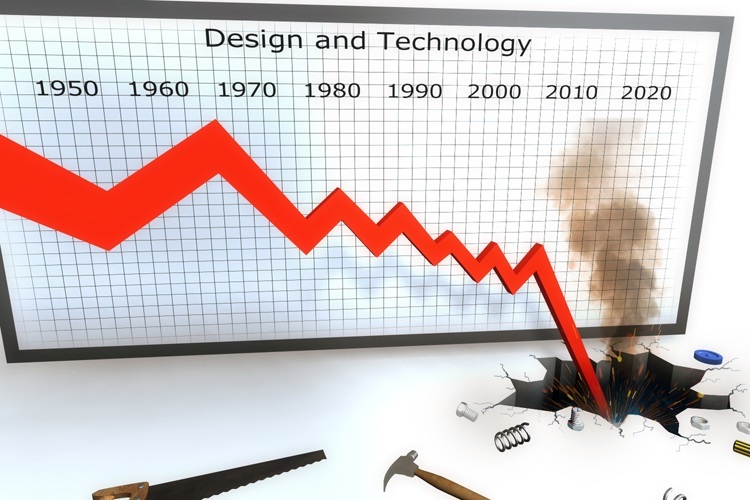 Engineering is up 5% on average while art and design is down around 4% so not too bad really. At GCE D&T again fares well at just 2% down with art and design down 6% and engineering up 1% but that is because in Northern Ireland engineering was down 50% while it was up 50% in Wales! Since these stats were released, many other documents pertaining to D&T take up were also released. Summer 2016 saw almost 10% drop in students taking D&T examinations with the subject as a whole representing 28% of the GCSE entries. Since 2004 entries have dropped from 440,000 to less than 200,000 with this decline beginning with the removal of D&T as a compulsory subject and it is likely to continue in the face of the EBacc and Progress 8. Students achieving the higher A and A* grades were down overall by 1.3% but in D&T they were pretty much the same as previous years. The percentage passing with a C or better was 61% (higher than engineering and science) but still, many teachers claimed they had experienced inconsistent marking of coursework and examinations. Based on the results alone, things don't look that bad. Sadly, it’s not just the students being affected, we also need to factor in that trainee teachers in D&T are becoming a dying breed. A glance at online forums and social media will show many teachers asking for help as they are teaching a subject or component for the first time. Can you imagine the strain on a young teacher to do that or, even more worrying, the potentially detrimental effect of such teacher responsible for examination level students. There were 28000 primary and secondary trainee teachers last year and in July the IFS reported that four in ten trainee teachers leave the profession within five years. Attracting new teachers is also increasingly becoming a problem. Of those 28000 trainee teachers, less than 600 were training for a D&T discipline with the target being more than double that figure. In 2011 109% of the target for D&T trainee teachers was met, in 2012 that dropped to 83%, 2013 saw the sharpest drop to 45%, then 42% in 2014 and 41% in 2015. Following that pattern will see trainee teachers in DT dropping to less than 40% of the numbers required in the next few years presuming of course that the subject (and subsequent demand for teachers) itself isn't removed from the curriculum which some schools have already suggested. To give an idea of how these compare, the number recruited overall have been in the region of 28000 in each of those years but in 2015/16 D&T was the lowest percentage of all subjects while other STEAM subjects were English 103%, maths 93 %, science 85% and even art (the second lowest percentage of recruits) managed 63% of its target. Secondary recruitment reached 82% of its target overall, primary 116% making it 94% overall so there is a 6% short fall there but nothing like the 59% in D&T. Lots of facts and figures to take in there and my brain is fried from trying to process all the data and make some sort of sense of it all. Do these stats do anything to support the idea that the EBacc and Progress 8 will drive out creative subjects such as art and D&T? I’m not sure they do but the sad fact remains that the structure of Progress/Attainment 8 with its core and EBacc subjects will leave just one or two options at best for students to choose from the open group and, facts aside, I have already witnessed a diminishing of the subject first hand in several schools and in moderation allocations. So, is D&T in decline? There are some who would say it's not only in decline but already being lowered into a workbench shaped 6 foot hole in the ground while those teachers fortunate enough to work in forward thinking schools who still value and support the subject may well have a very different opinion. Sadly, on facts alone, some of the figures above combined with the impending effects of the EBacc and Progress/Attainment 8 measures signal real problems for the subject no matter where you work. I had hoped that a year or two out of the classroom might reveal more genuine opportunities in design and technology should I return to teaching but, despite my love of the subject, I can't help feeling that it really is in a decline that will be hard to stop or reverse. Perhaps it actually needs to disappear from the curriculum in order for school leaders and government to realise just how important it really is and bring it back fully revived and as the leading subject it should be in a modern curriculum.